Stay ahead of the game in training, out and about or at the Ricoh Arena in this Wasps 18/19 Players Travel Jacket. 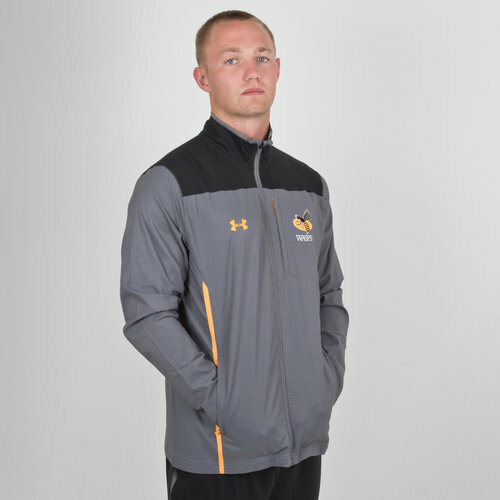 This jackets uses UA Storm technology to repel water without sacrificing breathability. Coming with windproof construction to shield you from the elements and a 3-layer bonded fabric with a durable, smooth exterior & soft interior. This jacket has an encased elastic waistband with internal drawcord and two secure, zip hand pockets. This shirt is predominantly grey with a black block at the top and gold detailing. 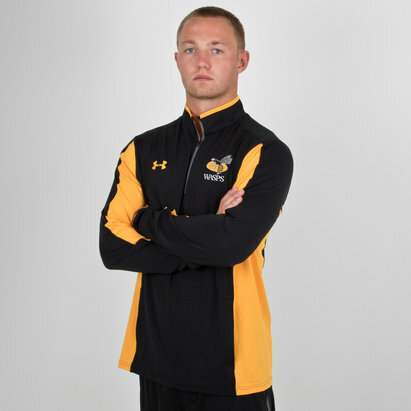 The Under Armour logo is embroidered on the right as worn in the same gold colour whilst the wasps logo is on the left. This season has seen the Wasps switch back to the club's original Wasps logo, with a wasp positioned over the top of a yellow ball and the word "WASPS" written underneath.